Most of our major “news” is derived from our press releases or from our daily blotter, a synopsis of activity from the previous day or weekend. The releases and the blotter have been sent to various media outlets, previously by fax, but recently by e-mail. As I mentioned in the Great Expectations piece, at the Boca Raton Police Services Department, we continue to adapt our communication strategy to improve the flow of information and to meet customer demands. Recently, we decided to make our press releases immediately available to the public, instead of sending copies to the media and posting the releases online at a later time. We have also increased the speed at which information is released through Nixle and Twitter. These changes caught the interest of a local television news outlet and they came to do a story on our use of social media. I think it was a great piece because it covered some of the tools we are using. However, the comments about bypassing the media “screening” process were important, because it illustrated what I believe to be a key issue surrounding the use of social media by law enforcement. Check out the article and video here http://bit.ly/25g7U. What is interesting about the reaction was that we didn’t change the information we released. We simply changed the timing relative to when the public receives the information. In this age of transparency, I think increased public access is a good thing. However, Mr. Brosemer has a valid point about the other elements of our communication strategy and social media elements. We are writing our own stories and creating our own news, using social media to reach a wider audience and, in some ways, creating our own spin. Why? Because we can and we should. Because of economic conditions and the explosive growth of social media, we certainly do not enjoy the media coverage we used to get. The local outlets do not have the resources they used to have and they are not interested in many of the items we think may be useful to our customers. I do not believe our constituents are mindless drones. They are perfectly capable of drawing their own conclusions about our stories and our spin. The beauty of our system of government coupled with the application of social media is the two-way nature of the communication. If someone doesn’t like what we are doing (social media or otherwise), I’ll hear about it. As we have demonstrated already, we are not afraid to identify shortcomings and make changes. Mark made an important point at the end of the Channel 5 piece. We, in no way, are trying to bypass the traditional media. Our social media elements provide yet another layer and function as a resource to them as well. I think the media will play a valuable role in this debate. More is good. Let me know what you think. Burrows’ early tweeting activity was to conduct scene management. He would tweet so that the media knew he was aware of a traffic accident, was on his way and would be providing updates. In fact, he credits a local television assignment desk editor with first suggesting he use Twitter to communicate with reporters. He still does scene management for the media, but he also tweets safety messages, tips of the day, and advises the motoring public where traffic enforcement officers will be conducting dedicated enforcement on any given day. Among the benefits he has experienced are improved community relations, faster notification of traffic accidents and a better educated motoring public. Interaction between Burrows and citizens over social media is increasing too and that bodes well for community relations. He has a stable of people who retweet his messages so his reach is expanded even further. Additionally, sometimes people ask for advice, send in photos with questions, or they’re angry about something. Burrows finds that getting back to an angry citizen with Twitter works wonders to build a bridge because the person is often happy just to have been heard and receive a response. “People are learning that police are not your enemy, we’re actually here to help keep you alive”. Burrows’ tweets automatically post to his Facebook page, where he also provides traffic safety advice and posts videos. He also has a traffic services blog to provide expanded observations, “When I say slow down on Twitter, on the blog I can actually tell people why they should slow down”. And of course, he uses Twitter to drive traffic to his blog. What lies ahead for Burrows and social media? He says the TPS is investigating setting up a Traffic Services TV podcasting channel possibly on Blip.tv or Vimeo or a similar service. 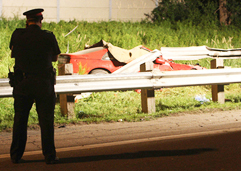 He explains, “we will recap major incidents and dissect why an accident happened. If we can explain why, that’ll help people avoid the circumstances so that maybe it won’t happen to them”. Burrows plans to have experts in forensics investigation and reconstruction provide expanded observations. His mandate was to find every way conceivable to spread the message of traffic safety and to communicate to citizens that it’s a quality of life issue. It’s a mandate he seems to be achieving. While he started with Twitter to talk to the media to help get info to the public, he’s learned very quickly that with much of his information, he can bypass the media and with Twitter actually talk directly to people. It’s been just a month and a half since the City of Boston, teamed up with the Boston PD and Stolen Bikes Boston to launch a social media strategy to recover stolen bikes. Just last week, the first bike was recovered through the plan. Postings on Facebook lead to the recovery of the bike in Arlington. Another bike that was stolen from South Station has been reported as being sighted in Roxbury. The director of this innovative program, Nicole Freedman, says the key is to alert as many people as feasible as soon after the bike is reported stolen as possible. People can choose from three ways to hear about a stolen bike, through Facebook, Twitter or an email list. 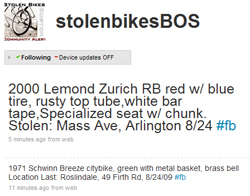 The notices go out after someone reports their bike as stolen at the website which is stolenbikesboston.com. Down the road, Freedman hopes to be able to hook up with police authorities, such as those at universities and hospitals to recover bikes that are stolen and subsequently dumped and hopefully match them up with their owners. “Believe it or not” says Freedman, “there’s a significant secondary market for higher end bikes that quickly get shipped out of the area for resale elsewhere, often out of the country”. Tracking down those bikes will be challenging. Social media is about creating conversations. The Boston Bike program is doing just that. But for the program to achieve real success will require an engaged public to participate by reading at least one of the three informational feeds and then being on the lookout. The alerts go to any citizen who signs up as well as police, bicycle repair shops and others in the cycling community. So far, the Boston Bikes program has 173 registered users and 66 stolen bikes. To date, 380 people are Facebook fans, there are about 250 followers on Twitter and 50 who have asked for alerts through email. Freedman acknowledges that they’re still pedaling uphill and will continue to until they reach a critical mass of followers. She says, “one thing I know is that there are a lot of people that are coming very regularly to follow the stolen bikes program. It seems to be becoming viral.” Followings are built slowly, once they pass the crest of the hill, it’s certain to pick up steam.